Arbee Associates is proud to introduce our partner company, Modern Grain. Modern Grain is a furniture manufacturer that strives to design creative and sustainable office spaces for the modern workplace. They combine original design ideas with the highest quality material available to create long lasting and beautiful office furniture that could be mistaken for a work of art. The Modern Grain design philosophy incorporates three main ideas—integrity, collaboration, and sustainability. 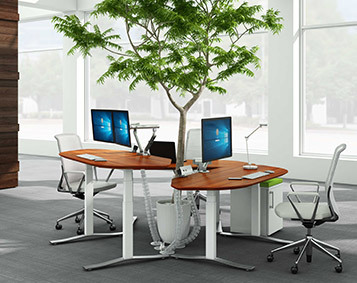 When combined, these ideas create truly unique and durable office furniture designs. Integrity—One of the things that makes Modern Grain such a great company is their dedication to their customers. They always go above and beyond, providing excellent customer service and taking into account each individual customer’s preference when custom designing office furniture. Collaboration—The joy of working with Modern Grain is that you really get to work with their team on an inside level. 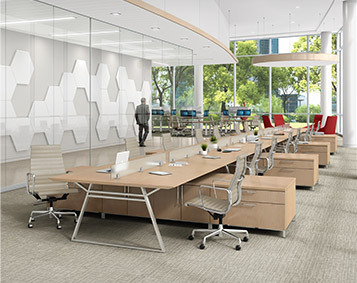 Modern Grain encourages customer collaboration in every stage of the office design process. They take into account your unique business and find specific solutions for all your office design needs. Sustainability—Modern Grain is a company that care about the environment. They do everything they can in the designing and manufacturing process of their products to minimize the environmental impact. Modern Grain prides itself in creating products that matter. This means that in every step of their process, from the seed of the idea to the finished product in your office, you can rest assured knowing that care and concern about sustainability and durability were put into every square inch of your design. Modern Grain started as a family name in modern woodworking and furniture and has grown into what it is known as today, a high-quality office furniture design manufacturer. Behind each piece that Modern Grain produces is the long legacy of the Geiger family’s dedicated to their craft. Their goal has always been to create unique and practical pieces of furniture produced sustainably for a brighter future. Every piece of Modern Grain furniture is designed to be customizable and flexible. No matter your office design needs, Modern Grain has the ability to work closely with every customer to scale up or scale down and meet all of your needs. Modern Grain truly puts the customer first and provides low-cost large scale manufacturing products including added components that have the user in mind. Provides flexible desking solutions with clean, modern frames. Combines new and old design to create a unique blend of form and function. Constructed from sustainable North American hardwoods. Flexible and easily customizable workspace solutions. Can be configured in thousands of different ways to suit various needs. Perfect for creating unique private or open space office designs. Available in a range of designs from modern minimalist to traditional. Uniquely created to enhance your brand and make a great first impression. 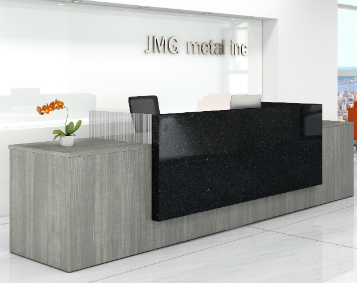 A reception solution that is as functional as it is stylish. Modern Grain’s answer to height adjustable desking solutions. The innovative shape balances the need for privacy and collaboration. The perfect piece of office furniture to increase mindfulness and focus. Available in a wide range of sizes from 12 to 30 inches. Constructed from the finest materials such as wood, stone, metal, and glass. Includes the ability to incorporate technology like power, data, and audio/visual equipment. A perfect addition to any university or corporation. 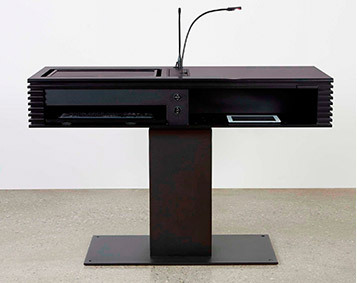 Provides a speaker of any height a comfortable way to deliver their message. Highly customizable to each company’s unique needs. 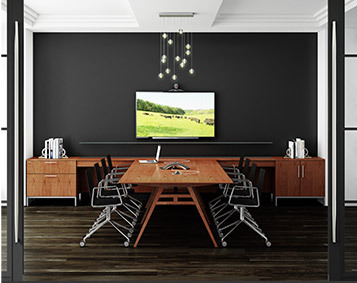 Modern Grain is an office furniture manufacturer that cares. You can see their commitment to the craft in every corner and crevice of their furniture. 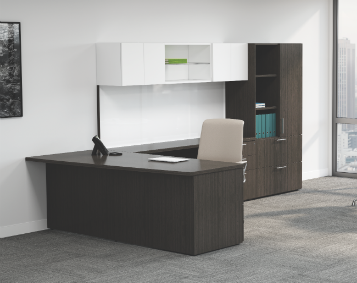 Modern Grain has the perfect office furniture to meet your workplace design needs.